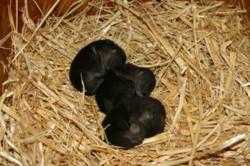 Ginger, Oakland Zoo's river otter, gave birth to a litter of three baby otters on February 18, 2012. They each weighed approximately 150 grams at birth. Currently, the pups are nursing, starting to open their eyes and are growing each day. In a few weeks, they will begin eating fish and meat. Keepers also say the babies are very vocal, especially the female. The baby otters will not go out on exhibit until May as they first need to learn how to swim (it’s not instinctual) and need to be a certain size before leaving the night house. 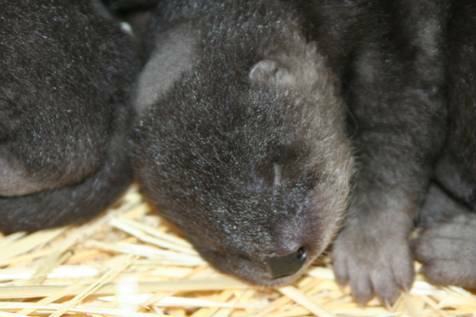 The public will not see the baby otters on exhibit until the month of May. 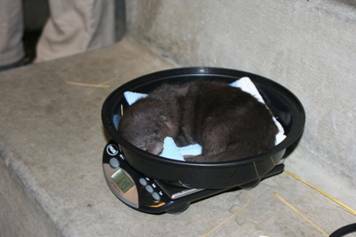 On Thursday, March 22, 2012, Oakland Zoo, gave a sneak peek at three baby river otters (two males and one female), in their night house. The otters were born to Ginger, river otter, on the afternoon of February 18, 2012. Each baby weighed approximately 150 grams at birth. "It is very important for baby otters to learn appropriate social behavior from their mothers, so we are happy that Ginger has been such a great mom and is raising such well adjusted pups,” said Margaret Rousser, Zoological Manager. Currently, the pups are nursing, starting to open their eyes and are growing each day. In a few weeks, they will begin eating fish and meat. Zookeepers also say the babies are very vocal, especially the female. The baby otters will not go out on exhibit until May as they first need to learn how to swim (it’s not instinctual) and need to be a certain size before leaving the night house. The public will not see the baby otters on exhibit until the month of May.